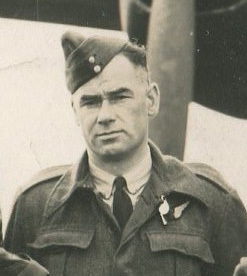 Leonard Eaton, aged 37, was the oldest man to take part in the Dams Raid. He was born in Manchester on 16 March 1906, one of the seven children of Thomas and Edith Eaton. He followed his father’s trade as a bookbinder after leaving school. He enlisted in the RAF in 1940. He was eventually sent for training as a wireless operator/air gunner and was posted to a conversion unit in the late summer of 1942. There he became one of the first people to crew up with Joe McCarthy, flying for the first time with McCarthy, Bill Radcliffe and Ron Batson on 13 September 1942. The crew joined 97 Squadron, and Eaton flew on 17 operations during their tour, missing two periods of about a month, presumably through illness. The crew then transferred to 617 Squadron. When they eventually took off on the Dams Raid, Eaton had a problem with the radio equipment in the spare aircraft AJ-T, and lost communication with Group HQ. Aware that this should mean that he abort the trip, McCarthy told him he didn’t hear what he said, and ploughed on. Eaton must have got the set working again, as later on they were able to communicate their progress, and he was able to hear the code word for the breach of the Möhne Dam being transmitted as AJ-T lined up to attack the Sorpe. Following the raid he completed a further 34 trips with McCarthy, until the whole crew were taken off operations in July 1944. He was promoted to Warrant Officer in June 1944, and awarded the DFM. In August 1944, he was posted to a training unit and commissioned. He left the RAF in 1945 and took up employment as an agent for a clothing firm. He carried on this work until his retirement. Len Eaton died in Manchester on 22 March 1974 and was cremated at Manchester Crematorium. Thanks to Roy Eaton for his help with this article. Survived war. Died 22 March 1974.